So since the end of January when I officially began my training and committed entirely to running regularly, I have run 161 miles and spent over 25 hours putting one foot in front of the other. It’s crazy to think that last fall I wasn’t even thinking remotely about changing my routine as much as I have in the past two months. I’ve officially become comfortable with the schedule and the amount of time it’s going to take in order to commit to living up to the mother of all dreams (for now, at least)–the Chicago Marathon. Last week was spent being anxious and worried. Saturday morning would be my first race of the ‘season’ and I wasn’t sure if I had prepared well enough to get the time that was running through my head. On Monday, I wasn’t feeling so great and was dealing with the symptoms of a minor head cold. Rather than going home and feeling depressed that I couldn’t motivate myself enough to get my blood pumping for at least a half hour, I went to the gym and tried to push myself. (I would have much rather gone for a run outside, but Chicago has decided to completely ignore the fact that it is, indeed, spring! Just silly.) All day I tried to decide between two different workouts–a 6 mile tempo run or a full-on 6 x 800 Yasso workout with 1 mile warm-up and cool-down. I decided that I would be a wuss if I left myself get by with just running a normal tempo run (3 miles at long & slow, 3 miles at race pace or faster). Whether or not this was a good decision–I don’t even know if I could tell. My left knee was tight and bothersome during an easy 2 mile warm-up. The distance turned to ‘2.0 Miles’ on the treadmill and I found myself increasing the speed by over 2.0 mph and letting my legs fly. It’s funny how sometimes the motivation to run even faster can come in one split second. And essentially totally change what you tell your body to do for the next 30-45 minutes. I leveled with myself after 3 or 4 strong-ish 800s at 7:13 pace and told myself I would decrease the Yasso laps from 6 to 5 just to keep my knee in check. I ended with a slow cooldown with thoughts about my knee going through my head–why now? what should I do? should I stretch it out? should I ice it for hours when I get home? should I even try to push it this weekend? should I play it safe? —> all of those nasty negative blunders that can get the best of you when you don’t need ’em around. I went home and felt good about what I accomplished…and thought about how I didn’t want to disappoint myself on race day. The week was slow and regular. I managed to work in another 4 slow miles on Wednesday despite a runny nose that was determined to outrun even itself. 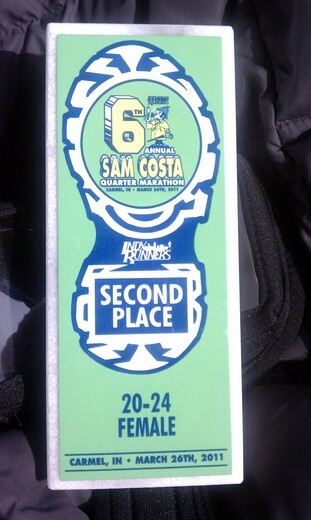 The knee felt better and I was preparing to be mentally secure with an 8:30 pace for the Sam Costa Quarter Marathon. While 8:30 would not be such a horrible pace for my first race of the season, it’s hard for me to acknowledge that it’s ‘good enough’. Afterall, ‘good enough’ on Race Day seems like it should leave you empty of all the energy you arrived with but the adrenaline of having run such a great race. Saturday morning arrived with an alarm clock at 6:45 a.m. in Indy. My body was still set on Chicago time and believe me, I felt the loss of that hour! Chris, my brother, arrived at the house around 7 am reeling and ready to go. He said it perfectly when he admitted , “I look relaxed and calm on the outside, but inside my brain is going a mile a minute”. Chris was to run the Half Marathon and officially his first race of the season. I managed to squeeze in a cup of coffee, a small bowl of Rice Chex with a splash of milk, and headed out the door with my family, my support. When we arrived near the start and entered the church that was hosting us that morning, I wouldn’t say I was energetic or ready or pumped or psyched–or any of those words that you think of when someone is excited to accomplish the first goal of many. I was calm. I was collected. I got my bib, put my shoe tag on, and readied myself for the race that my body wanted to run. Chris, a friend, Mark, and I went out for a light one-mile warm-up and headed for the start line. It may sound very cliche, but everything clicked the moment I started running. My warm-up had contributed to my worries about my knee, as it just wouldn’t relax and let the tension go. Shooting pains through my knee cap made me think that it may be a really long race for me that morning. But when I took off from the start line, I was calm, steady, and keeping up with a steady pace. After a Runkeeper snafu, I finally managed to calculate my split times from the audio cues and keep an 8:00 min/mile pace from one mile to the next. I really don’t know what I was thinking about during the race. I feel like I didn’t even listen to the music pumping through my ears and didn’t really realize where I was on the course. I only stopped for a quick gulp of Gatorade at mile 2.5 and avoided the rest of the hydration stations. I just felt like I didn’t need it. In a few words, I was: blank, steady, strong, and confused why it seemed easy. Coming up the last hill of the race, I knew that I was going to blow my goal time of 53′-55′ minutes out of the water. I crossed the finish line at 50:12 with an average pace of 7:40 min/mile. WHERE THE HECK DID THAT COME FROM?! I don’t think I have an answer to that question even 2 days post-race. All I know is this–those Yassos must have paid off ! I was the 8th woman to finish and won 2nd place in my age group! And I’ve got the hardware to prove it! …And as my brother so aptly put on Dailymile post-race, AND BOOM GOES THE DYNAMITE!